NETWORK UPDATE: FOX has asked that the ratings for EMPIRE be counted as two separate hours, and that gives them adjusted numbers of 6.1 for 8-9PM, and 6.9 for 9-10PM, with an astonishing 7.2 for the show’s final 15 minutes. 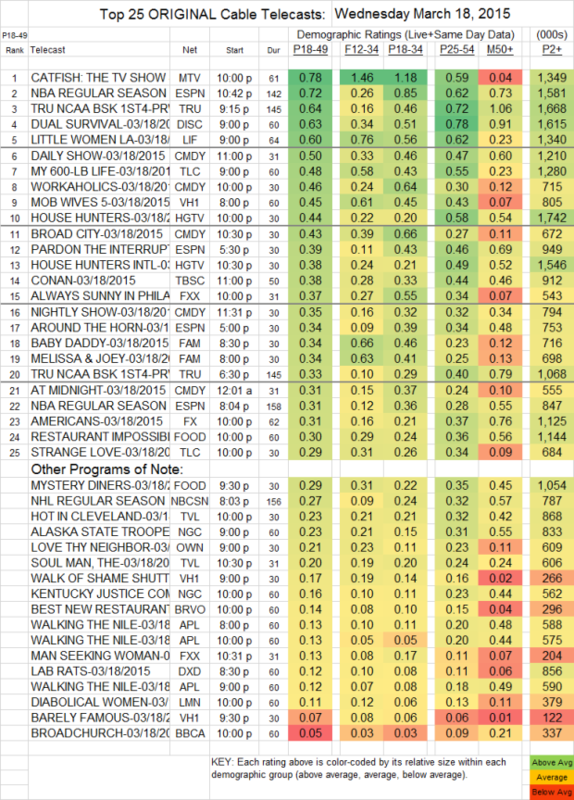 (The overall 2-hour average is 6.5, up 0.1 from the morning ratings.) On CW, ARROW rose by 0.1 to 0.9, but SUPERNATURAL dropped the same amount, putting it at 0.6. Elsewhere, SURVIVOR gained 0.1 to 2.3 (but CSI: CYBER remained at 1.4). The BLACK-ISH rerun also found an extra 0.1. CATFISH (MTV) was at the top of Wednesday cable, up 0.13 to 0.78. Pro basketball beat college for the night, as ESPN’s NBA games were at 0.72/0.31, while Tru’s NCAA TOURNAMENT games were at 0.64/0.34. On Discovery, DUAL SURVIVAL was down 0.03 to 0.63. LITTLE WOMEN LA (Lifetime) gained 0.11 to 0.60. On Comedy Central, WORKAHOLICS dropped 0.08 to 0.46, and BROAD CITY fell 0.06 to 0.43. MOB WIVES (VH1) was down 0.11 to 0.45, and the premieres of HALL OF SHAME SHUTTLE and BARELY FAMOUS were at 0.17 and a wan 0.07. (At least it makes HINDSIGHT look good by comparison.) On FXX, IT’S ALWAYS SUNNY IN PHILADELPHIA rose 0.05 to 0.37, and MAN SEEKING WOMAN held at 0.13. ABCFamily’s MELISSA & JOEY dropped 0.04 to 0.34, and BABY DADDY was also at 0.34, which was down 0.02. THE AMERICANS fell 0.04 to 0.31. HOT IN CLEVELAND (TVLand) was at 0.23, and SOUL MAN was at 0.20. LOVE THY NEIGHBOR (OWN) lost a tenth to 0.23. BROADCHURCH (BBCAmerica) shed 0.02 to 0.05.